When you travel on Qantas, there is a lot of history behind you. Qantas is one of the oldest airlines in the world, being founded as long ago at 1920 when it was called the Queensland and Northern Territory Aerial Services Limited. Initially the airline operated air mail services subsidised by the Australian government, linking railheads in western Queensland. Once it had kicked off services, it started building its own aircraft under licence from de Havilland in its Longreach hangar. By 1934 the airline had expanded so much, it was eyeing overseas routes, and together with Britain's Imperial Airways (a forerunner of British Airways) formed a new company, Qantas Empire Airways Limited (QEA). It's first route was from Brisbane to Darwin, but by 1935 the Darwin route, as always planned, was extended to Singapore, and then on Imperial Airways onwards to the UK. By 1938, this service was replaced by flying boat three times a week, taking nine days to get to Southampton. The war, and the fall of Singapore got in the way, and the only way around was a long diversion from 1943 from Perth to Ceylon (Sri Lanka), linking with BOAC. By 1944 larger aircraft could fly from Sydney to Karachi, where crews from the UK took over: at this time the route was nicknamed. Why was it called the kangaroo route? Not only for the way that it hopped up and down with multiple landings, but also for the kangaroo on the plane's tail which appeared at this time. In 1947, QEA was nationalised, Qantas was wound up and liquidated. The government pumped money into their new company, allowing it buy initially Avro Lancastrian aircraft, then Douglas DC-4s, used to Tokyo and Hong Kong. London however always remained the trunk route of the colony, using Lockheed Constellations. By 1954 Qantas was flying in the other direction to San Franscisco (a route it only abandoned in 2011) and turned this into a round the world route in 1958. Qantas entered the jet age in 1959 with Boeing 707s - specially shorted by ten feet to enable it to be light enough to fly over the Pacific. These turbojet aircraft were converted to upgraded turbofan engines in 1961 and were rebranded as V jets from the Latin vannus meaning fan. In 1965 these aircraft operated on the Kangaroo Route, via Kuala Lumpur. By 1966 Qantas ordered the new Concorde airliner, but the orders were eventually cancelled, and instead in 1967 Qantas ordered four jumbo Boeing 747s. It cancelled the early version, and waited until problems had been ironed out, so it could order the better longer range 200 version. The airline was moving resolutely upmarket at this time, and by 1967, Qantas Empire Airways changed its name to Qantas Airways, the name of the airline today. Initially Qantas just operated it's jets with economy and First Class, however with the 747 it found there was plenty of space to offer something more, and it created the upstairs 'Captain Cook' lounge on the upper deck of the 747-200. It was a cross between a pub, and a 1970s cocktail lounge. Equally, it soon found there was a demand for better seats from people who couldn't afford all of First, and introduced Business class - the first airline in the world to offer better seats and food for those travelling on business. It was so popular, the upstairs lounge was later converted to Business Class seating too. It soon scrapped the ageing Boeing 707s, and ordered a cut down version of the 747, the SP, for shorter flights, becoming the only airline in the world to have a fleet that consisted of Boeing 747s only. However Qantas found it was being stretched in two ways. It needed smaller aircraft for short routes, and longer ones for the trunk route to London. For the latter it ordered ever larger Boeing 747s, taking on the 300 series in 1985 with a stretched upper deck, and the 400 series in 1989. Meanwhile smaller 767s came in for New Zealand, Asia and Pacific routes. At the time Qantas only operated international routes. It took the purchase of the domestic carrier Australian Airlines in 1992 before it could go back to its roots and operate domestically. To do so it flirted with Airbus A300s, before jumping back into the Boeing camp with a fleet of Boeing 737s. Qantas was partly privatised in 1993, with British Airways taking a 25% stake in the airline for 65 million Australian dollars, and the float was concluded in 1995. To coordinate schedules, routes and customers, in 1998, Qantas co-founded the oneworld alliance with British Airways, along with American Airlines, Cathay Pacific, and the defunct carrier Canadian Airlines. Ansett Australia, the main domestic competitor to Qantas, collapsed in September 2001. 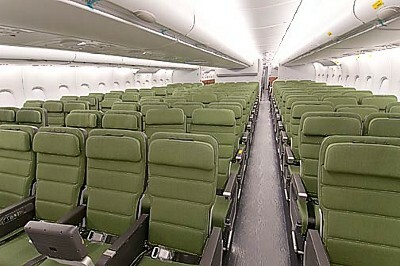 Qantas immediately saw its market share leap to 90%, and to capitalise on this event, Qantas ordered a fleet of brand new Boeing 737-800 aircraft. They were already on the production line and destined for American Airlines: they remain in the configuration the US carrier initially ordered, a condition of the sale for later possible leasing. Qantas developed an all-economy international carrier, taking on the formerly-used Australian Airlines name, for longer thin routes where there was less premium traffic. 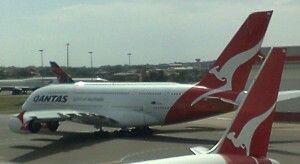 Passengers became confused by the three-brands, and the sub-airline was folded back into Qantas in 2007. It is however the rise of Jetstar that is notable for Qantas in the last decade. Virgin Blue by 2001 was making major inroads into Qantas market share, from10% in 2001 to 30% nowadays, by offering a low cost no frills product. Qantas did the same, as many mainstream airlines have done, by creating a new cut-price subsidiary Jetstar. 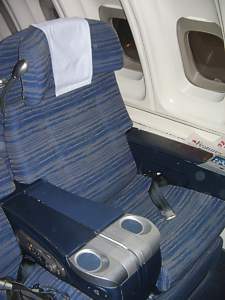 Unlike many other airlines it has however made a success of this model. Qantas has also expanded into the New Zealand domestic air travel market, taking over Ansett New Zealand. It operated these routes as Qantas for a while, but they later became Jetstar. Indeed the Jetstar brand was expanding. In 2004 Qantas opened a low cost hub in Singapore, called Jetstar Asia Airways, designed to service the Asian peninsular. 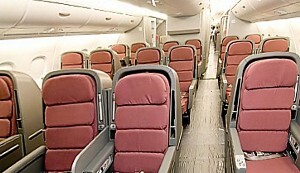 The Boeing 747, which constituted the entire Qantas fleet in the early 1980s, is slowly being retired. The last 747-300s were retired at the end of 2008, having previously operated from Melbourne to Los Angeles via Auckland, and also Domestically from Sydney to Perth. The same year the first Qantas Airbus A380 became part of the fleet, flying from Melbourne to Los Angeles . 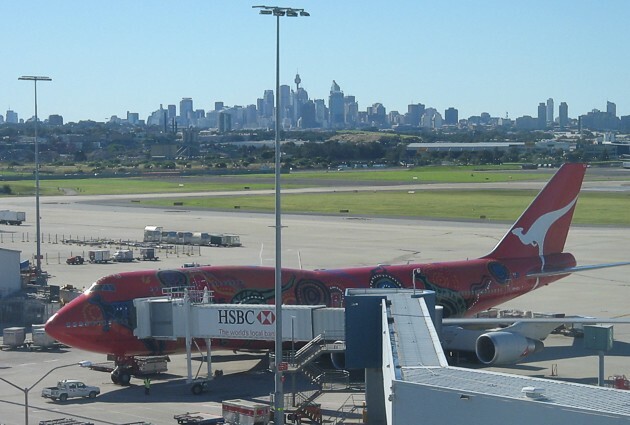 However, this aircraft starting flying just as the Global Financial Crisis hit, and to maintain profitability Qantas cut First Class on shorter International routes, just keeping them between Australia and London, via Singapore, and between Australia and Los Angeles.